During my listening sessions I ran these puppies through a plethora of platter spinning, reel running, and CD tracking. I used two different turntables with different cartridges, a reel to reel running at 7.5 IPS, and a CD player. The musical selections ran from Led Zeppelin through Zubin Mehta! I threw everything I had and could find through these amps. The requisite massive sound stage, depth, and breadth of which is as good as I have ever witnessed was all there in grand scale. Height and pinpointing as much as the source material allowed was spot on. I am certain that a good deal of this sonic goodness comes from the WE300 based tube—the AA62B! 300Bs have always been lauded for their ability to deliver sonic detail and delicacy in any application. They generally have not been known for massive grunt. A trade off many audiophiles will gladly make because after all detail and a lot of it is what separates tubes and generally high end audio from just running with a massive powered solid state unit for maximum grunt and decibels. What these amps do is provide plenty of both due to the AA 62B tube, a 300B on steroids. That does not come without a price but the ticket is well worth the bucks if you have them. 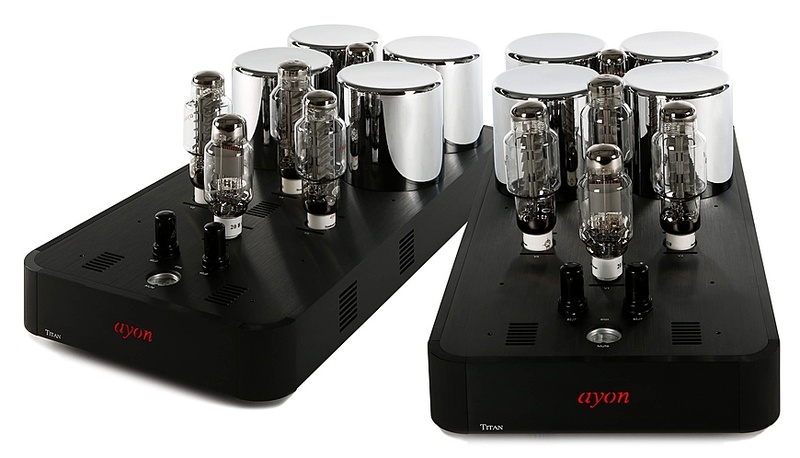 I have come to appreciate just how good Ayon products are; the line has something for everyone and I have yet to be in the presence of any of their gear and not been pleased and impressed because I have always been presented with quality and sonic delivery that made for a very good value at all levels for the asking price. The Titans are no exception to the Ayon rule. Definitely the pinnacle of their line of amps and they hold that distinction with well deserved pride and honor. If you are looking for a high end, top of the line set of monoblock amplifiers to live out the rest of your life with you might be able to find some others that will please you but I seriously doubt you would find any better at any price. If that sounds like where you are in your audio journey I suggest you run to audition a pair!